MPs will vote again on Brexit on Friday but it is not clear whether it will be another "meaningful vote" on the PM's withdrawal deal. Asked whether the motion would be the "full package", Commons Leader Andrea Leadsom said discussion was "ongoing". There is speculation that MPs might be asked to vote on the withdrawal agreement but not the further "political declaration". Labour said that would lead to the "blindest of blind Brexits". Shadow Brexit Secretary Sir Keir Starmer said both European Council President Donald Tusk and European Commission President Jean-Claude Juncker had stressed that the withdrawal agreement and political declaration were part of the same "negotiated package". He said to separate them "would mean leaving the EU with absolutely no idea where we are heading ... we wouldn't vote for that". Previous "meaningful votes" on the deal involved both the withdrawal agreement and the political declaration but Speaker John Bercow has said he would not allow a third "meaningful vote" on "substantially the same" motion as MPs had already rejected by historic margins twice. The BBC's Vicki Young said separating the two might get around the Speaker's ruling but, after Sir Keir's intervention, looked unlikely to get more votes on board. Last week the European Council agreed to postpone Brexit beyond the expected date of 29 March - offering an extension until 22 May, if MPs approved the deal negotiated with the EU by the end of this week. If not, it offered a shorter delay until 12 April, allowing the UK time to get the deal through or to "indicate a way forward". BBC Brussels reporter Adam Fleming said the official conclusions from last week's summit only mention the withdrawal agreement, not the political declaration. Announcing the government's intention to table a motion for debate on Friday, Commons Leader Andrea Leadsom said there would be a motion put forward later "relating to the UK's withdrawal from the EU." "The motion tabled will comply with the Speaker's ruling but the only way we ensure we leave in good time on May 22 is by approving the Withdrawal Agreement by 11pm on March 29, which is tomorrow. "The European Council has agreed to an extension until May 22 provided the Withdrawal Agreement is approved by the House of Commons this week. "It's crucial we make every effort to give effect to that and to allow the House to debate this important issue." Her Labour shadow Valerie Vaz asked for "further clarity... on whether this is in fact the meaningful vote three?" Mrs Leadsom said the motion would be tabled "as soon as possible" and discussions were "ongoing". Conservative MP Sir Oliver Letwin, who oversaw the process of "indicative votes", said the lack of a majority for any proposition was "disappointing". But he told the Today programme no "assumptions" should be made about the outcome of further indicative votes, which he believes should take place on Monday, if the PM's deal is not approved this week. The EU Commission's chief spokesman, Margaritis Schinas, said the bloc fully respected the process, but added: "We counted eight nos last night, now we need a yes on the way forward." Ahead of Wednesday's debate, Mrs May told a meeting of Conservative backbenchers that she would not lead the talks with Brussels over the future relationship between the UK and EU. She would resign as party leader after 22 May if her deal was passed, but stay on as PM until a new leader is elected. However, Downing Street said it would be a "different ball game" if the deal was not passed. But although the prime minister has won over the likes of former foreign secretary Boris Johnson, a number of Brexiteers are still refusing to vote for the deal. Mrs May needs to win over 75 rebels to overturn the 149-vote rejection of her deal on 13 March. Many, including prominent Brexiteer Jacob Rees-Mogg, will not side with her unless she gets the support of Northern Ireland's Democratic Unionist Party - whose leader said on Wednesday they could not vote for the deal. 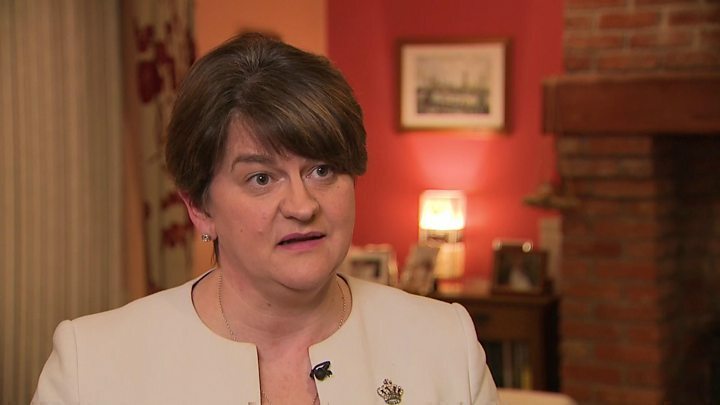 Media captionArlene Foster: "Backstop makes it impossible for us to sign deal"
The DUP's main objection is to the backstop, the "insurance policy" designed to avoid the return of border checkpoints between Northern Ireland and the Republic of Ireland in the event a future trade deal is not agreed. There are also signs Theresa May's offer to resign has hardened Labour opposition as they fear what the next Tory leader will push for. Labour MP Liz Kendall said: "I am extremely worried about our future relationship with the EU, and whatever is agreed in Parliament on the withdrawal agreement, the next Tory leader - if they're a hardline Brexiteer - will push for a hard Brexit. I for one am not prepared to let that happen." If Mrs May's deal is not approved this week, MPs are likely to resume discussions about some of the options rejected through the indicative voting process. 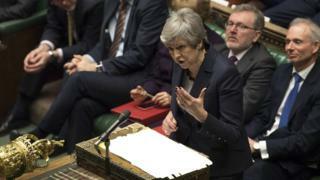 Of the options voted on on Wednesday, the ones with the most supporters were Margaret Beckett's proposal for a confirmatory referendum, which was defeated by 27 votes and Ken Clarke's proposal for a customs union, which lost by eight votes.